One of my good friends sent me this picture this week and I liked it so much I had to share it with you. I have to start with a disclaimer. 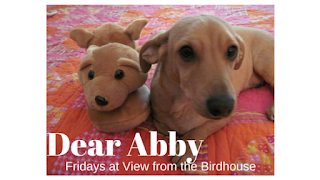 I am a dachshund mix. Our vet says I am a dachshund - Jack Russell mix. From the Jack Russell side I got a love of running in circles, a tendency to bark with short excited yips, longer legs, and fun ears. The rest of me? 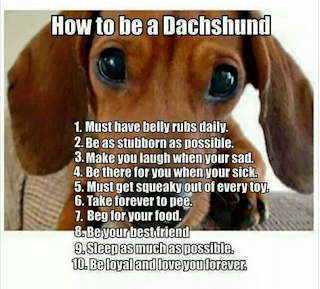 Well the rest is dachshund. Let's go through this fun list! 1. Must have belly rubs daily. Yes to belly rubs (of course!). 2. Be as stubborn as possible. I am not very stubborn. Momma says I have a "pleasey" personality. I think that means I want everyone to be happy. And yes, I do. 3. Make you laugh when you're sad. I am cheerful and love to make people smile or laugh. 4. Be there for you when you're sick. I am also a wonderful nurse. 5. Must get squeaky out of every toy. Nope! I don't agree with this. My toys are lovies. I would never hurt them. 6. Take forever to pee. I am pretty matter of fact about potty business ... I like to get it done and then see who is outside to visit. 7. Beg for your food. What do you mean "your food"? Isn't it all ours? It seems it should be. 8. Be your best friend. Of course! 10. Be loyal and love you forever. This is true, especially my Momma. What do you think of the dachshund rules? I would love to hear from you in the comments below. Please send questions too, for future blog posts! This was absolutely adorable! It makes me miss my puppy even more! I had to move away for school, and sadly he could not come with me. Thanks for bringing a little sunshine into my day! Aw, dogs are the sweetest. My two are always trying to make me happy and looking worried when I'm stressed. Thanks! I appreciate you visiting my blog today. Your pups sound wonderful! Awww, how sweet! And funny.